To unfold the inner or hidden traits of individuals astrology signs play a very important role. 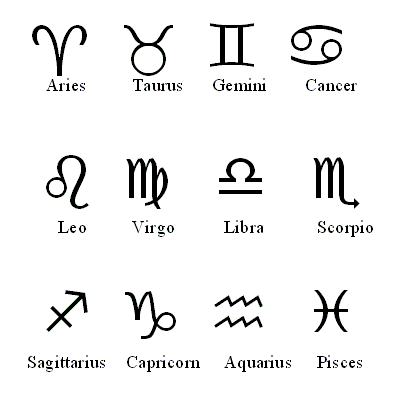 Twelve astrology zodiac signs provide some general descriptions about the subjects. All individuals come under any of the twelve sign according to his or her date of birth. You may be interested to know, how the signs in the heaven can influence or control the lives on the earth. To understand better, we must know how the signs themselves are characterized. Here in this page, you will find the signs are further classified in different groups and each group is related with some characters. Those are the characteristics of zodiac signs. The human beings are also characterized accordingly. Six signs are considered Masculine and other six signs are Feminine. In this context we should keep in mind that masculine sign does not mean positive or forceful and similarly feminine are negative and week. These attributes were given to these sign two thousand years ago. Probably the astrologers of those days tried to find out the complementary characteristics among the signs. They found some signs are outer- directed and strong through actions thus they are masculine whereas some signs are self contained and strong through inner reserves thus are feminine. Masculine signs- Aries, Gemini, Leo, Libra, Sagittarius, and Aquarius. Feminine signs- Taurus, Cancer, Virgo, Scorpio, Capricorn and Pisces. The twelve astrology signs are further divided into four groups containing three signs each. Each three sign group is called a triplicate, and each of these triplicates denotes an element-Fire, Earth, Air and Water. These indicates the fundamental characterization of the sign. Fire signs are Aries, Leo and Sagittarius; these signs indicate subjects are active and enthusiastic. Earth signs are Taurus, Virgo, and Capricorn - which indicate practical and stable. Air signs are Gemini, Libra, Aquarius - these indicate intellectual and communicative. Water signs are Cancer, Scorpio, and Pisces - they indicate emotional and intuitive. Twelve astrology signs are divided into three groups, containing four signs each. Each four sign group is called a quadruplicity, and each of these quadruplicates denotes a quality. The three qualities are Cardinal, Fixed and Mutable. In astrology, the quality signifies the signs’ interaction with the outer world. Cardinal- Aeries, Cancer, Libra, and Capricorn; Cardinal signs are enterprising and outgoing, they are initiators. Fixed- Taurus, Leo, Scorpio, and Aquarius; Fixed signs are resistant to change. They are perfectionists and finishers, rather than of originators. Mutable- Gemini, Virgo, Sagittarius, and Pisces; they are flexible, versatile and adaptable. They are able to adjust to different circumstances. You will notice each of the twelve signs falls into a different combination. No one sign in the zodiac has exactly the same duality, element, and quality as another sign. For example Leo is Masculine, Fire, Fixed sign: there is no Masculine, Fire, and Fixed sign in the zodiac. Finally, the twelve signs are divided into six groups containing two signs each. Each two sign group is called a polarity (meaning opposite). Each sign in the zodiac has a polarity which is its opposite sign in the other half of the zodiac. The two signs express opposite characteristics. Aries and Libra are a polarity. Aries is the sign of self; the opposite sign Libra is the sign of partnership. Taurus- Personal possession, Scorpio- Legacies and Shared possession. Gemini- Self expression, Sagittarius- Sign of philosophy and higher thinking of expression on a wider level. Cancer- Home life, Capricorn- Public life. Leo- Personal pleasure and Creativity, Aquarius- Hopes and Ideals of a large scale. Virgo- Work and Self improvement, Pisces- Dreams and Self Delusion.